GCC Energy received approval for the expansion of the King II coal mine in western La Plata County, a reflection of the Trump administration’s directive to streamline energy projects. 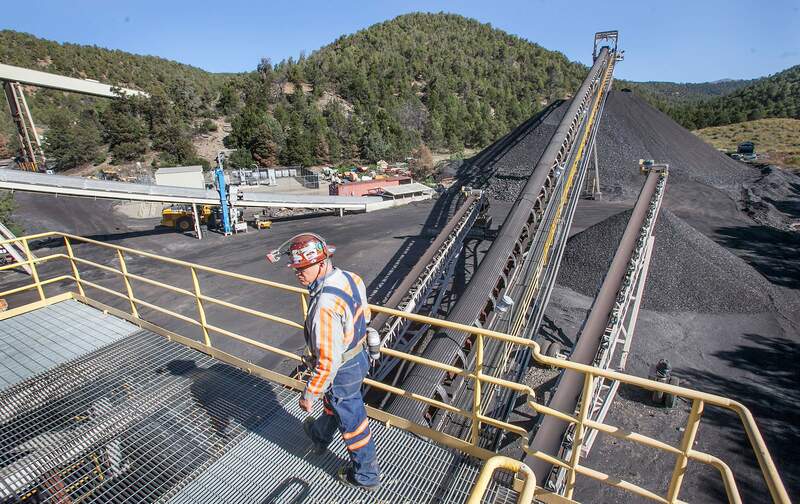 The Trump administration’s vow to streamline energy development has helped La Plata County’s only running coal mine receive quick approval for an expansion that will extend operations until at least 2023. Preparing for its coal reserves to run out, GCC Energy, which has operated the King II coal mine near Hesperus since 2007, asked the Bureau of Land Management for an expansion of 950 acres of underground workings. The request for expansion was granted Dec. 15 by the Interior Department in Washington, D.C., rather than going through the BLM’s state office in Denver – a process that sped up the approval and eliminated the possibility for appeal. Steven Hall, spokesman for the BLM in Denver, said the decision reflects the Trump administration’s orders to expedite energy development, as well as streamline decision-making processes as it relates to the extraction industry. GCC Energy representatives said in June the mine was on track to run out of reserves in two years. If the expansion weren’t granted, the company would be forced to shut down, laying off about 100 employees and cutting local tax revenues, officials said. The King II coal mine, even before the proposed expansion, had drawn criticism, especially from residents on County Road 120, also known as Hay Gulch Road, the main access road to the mine. Residents cited impacts on health, noise, traffic and water safety. The associated issues with King II prompted many in public comments to call for the BLM to conduct an environmental impact analysis, a more detailed and comprehensive study than the previously completed environmental analysis. Last week, the BLM said an environmental impact analysis was unnecessary and announced it would approve the expansion of the King II mine – albeit in a rather unusual manner. Typically, a mining company that operates on BLM land in Colorado that makes a request for an expansion will have its request reviewed and decided upon by the BLM’s state office in Denver. Regardless of the outcome, once the BLM reaches a decision, interested parties have the opportunity to file an appeal with the Interior Board of Land Appeals, a review body under the Department of the Interior (which the BLM is also part of). However, GCC Energy’s request for expansion was signed and approved by the Interior Department’s deputy assistant secretary in Washington, D.C., which means the decision can’t be appealed and is effective immediately. The Trump administration’s efforts to ease regulations on the industry have been well-stated, especially after he signed an executive order last summer aimed at streamlining energy projects by bypassing processes such as environmental reviews. In October, Interior Secretary Ryan Zinke released an “energy burdens” report that detailed that policy shift. Critics of the decision say the Interior Department’s efforts to bypass the appeals process is an attempt to silence opponents and deny people an opportunity to have their voices heard. Nichols said because the Interior Department removed the appeals process, it leaves challengers with only one option: to sue. While WildEarth Guardians is considering filing litigation, that may not be so easy for most residents, he said. GCC Energy representatives did not respond to requests for comment Thursday. Since the company took over the King II mine, it has averaged about 700,000 tons of coal per year, which is used mainly for cement production. But increasingly, production has waned as the industry takes a downturn. According to state records, GCC Energy hit a high in 2014 when it pulled 970,790 tons of coal from the mine. In 2016, a dip in production saw the company produce 628,953 tons. This year, GCC Energy is on track to hit 550,000 tons of coal. Regardless, GCC Energy representatives point to the economic jolt the mine has on the local economy, namely employing about 100 people and contributing about $3 million in taxes and royalties to the state and county. The approved expansion of 950 acres to the mine’s existing 1,311 acres will make 4.66 million tons of coal available for extraction, the BLM said, continuing the life of the mine by about five to seven years. “This decision allows over 100 jobs to stay in our community, along with the economic benefits from federal mineral development,” said Connie Clementson, the BLM’s Tres Rios Field Manager, in a prepared statement. The BLM said in its announcement that GCC Energy employs 140 to 165 people. Gina Nance, GCC Energy vice president of environment and energy, said recently that number is more realistically 90 people. Although GCC Energy cleared an obstacle with the BLM, it has to receive approval of its permit with the Office of Surface Mining and Reclamation and Enforcement, as well as the Colorado Division of Reclamation, Mining and Safety, before it can start operations on the additional 950 acres. It’s also unclear how the expansion will effect GCC Energy’s land-use permit with La Plata County, if at all. For almost 10 years, GCC Energy operated King II without a county land-use permit after county officials at the time determined it did not have jurisdiction over the mine. The county reversed its determination upon further review and, in 2016, approved GCC Energy’s land-use permit.